Recent stories in the media surrounding the possible relocation of Bruce Garner’s popular sculpture on Sparks Street of a grizzly bear reminded me of the fine collection of his works installed throughout downtown Ottawa, all within convenient biking distance. So I came up with this tour. We begin at the corner of O’Connor and McLeod to visit Bruce’s last work, Paso Doble. 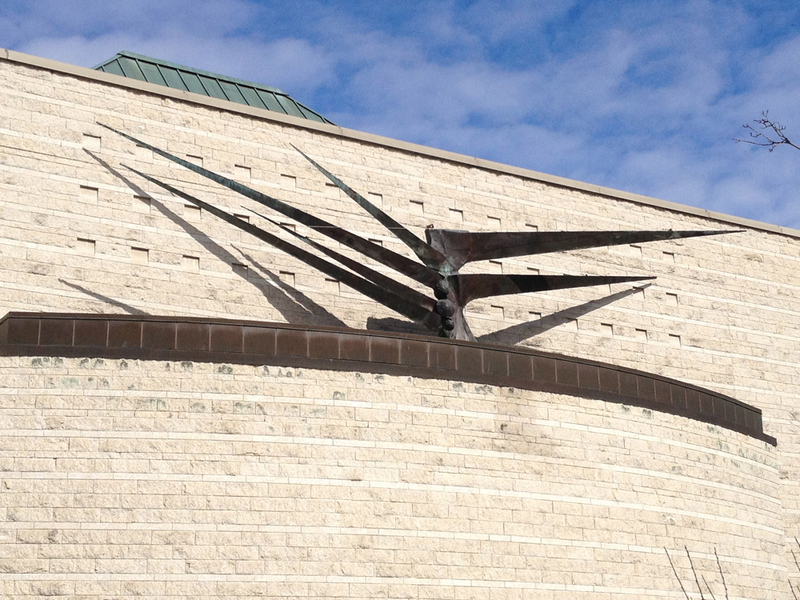 Next stop, Ottawa City Hall, more specifically the southern entrance, where this sculpture titled Outreach sits perched high up on a ledge. 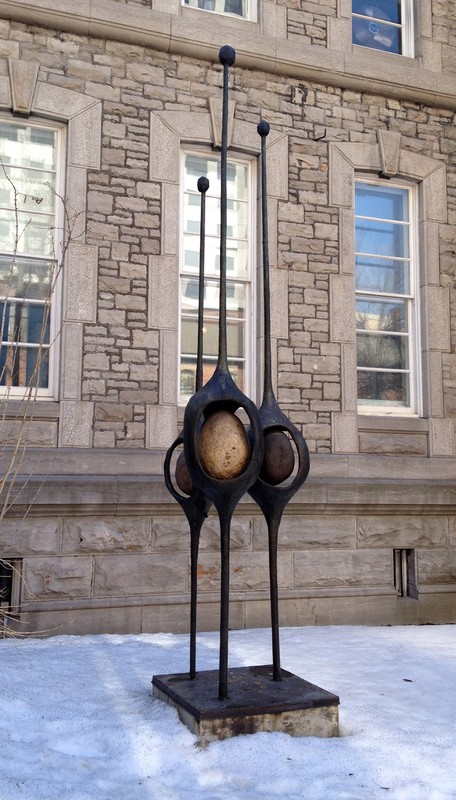 Over on Elgin Street, in front of the Provincial Courthouse, you will discover the sculpture Due Process. 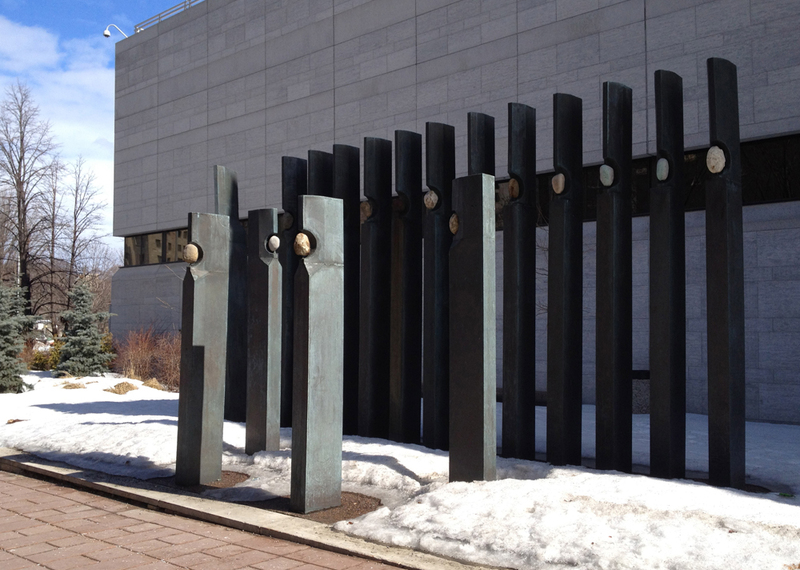 The next sculpture at the eastern end of Laurier isn’t one of Bruce’s pieces. 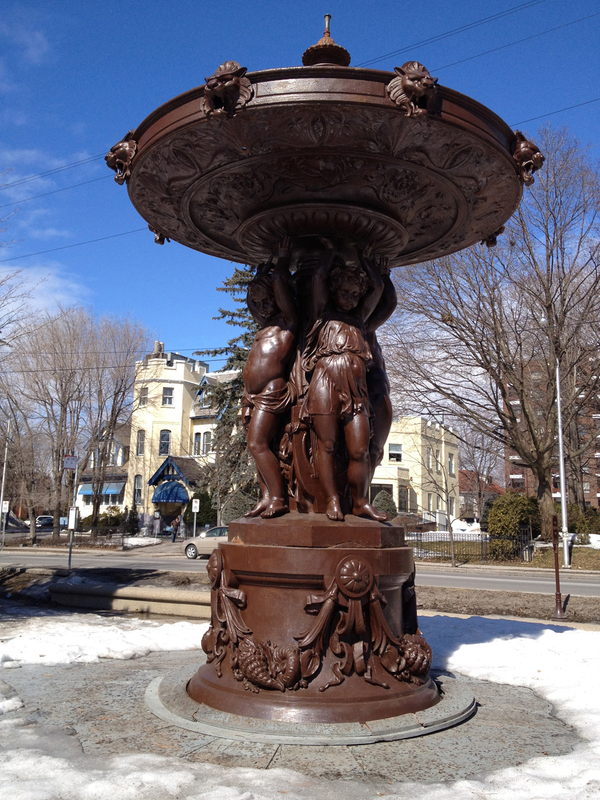 It is the Lord Strathcona Fountain sculpted by Marhurin Moreau and donated to the city by Lord Strathcona in 1909, however awhile ago I came across an article that described the time and care Bruce and his wife Tamaya dedicated to the upkeep of this iron sculpture. The article spoke of the passion he had for the piece, so I’ve included it in the tour. Unfortunately the article is no longer online for me to link to. Back into town and over to the Byward Market where from atop the Chum FM headquarters fly these two winged wonders, a piece sculpted by Bruce called Dagain. 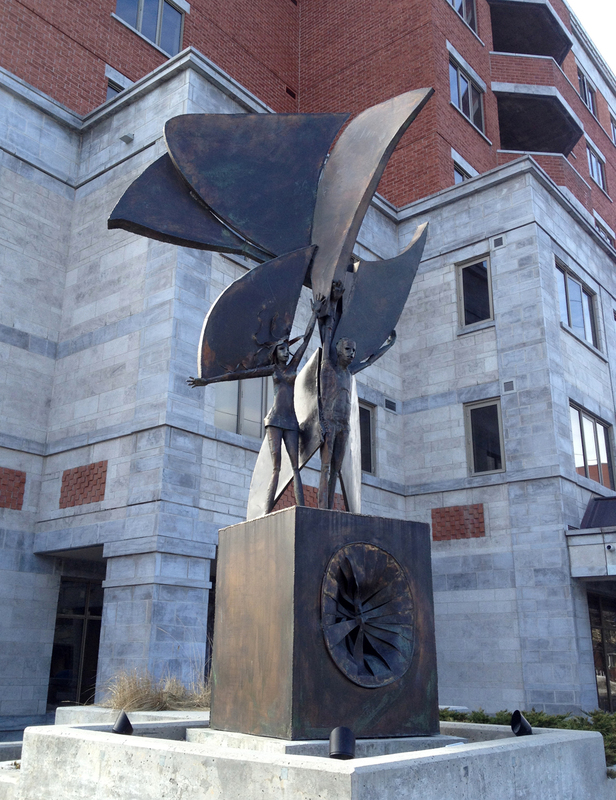 Next, over to Arts Court where sits this sculpture just to the left of the main entrance. 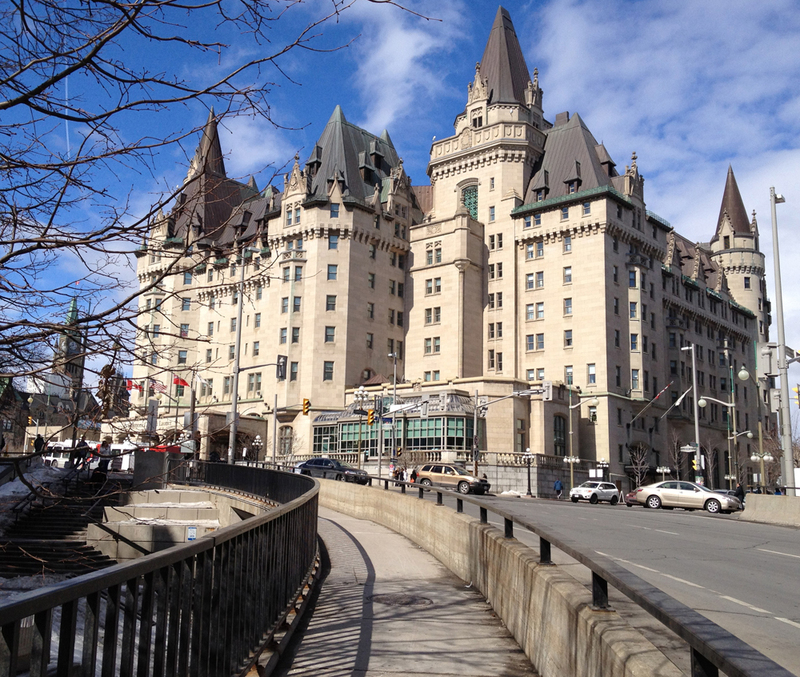 Follow Daly Avenue for a short distance as it dips under the Westin Hotel to the edge of the canal where you will find the Conference Centre. 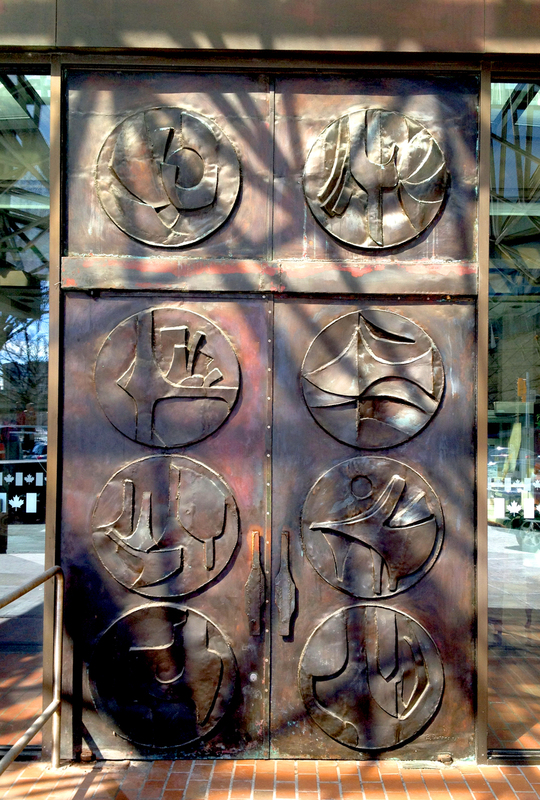 The main doors and transom were sculpted by Bruce out of bronze and copper. To get to Sparks Street to view the last two works on this tour I suggest walking your bike up along the curved sidewalk, shown in the image below, to Plaza Bridge and continue in front of the Cenotaph over to Sparks Street. I’ve hi-lited this walk in red on the above map. I recommend becoming a pedestrian for this section of the tour because it is far less convoluted and dangerous than trying to weave you way through the usually busy traffic in this area. 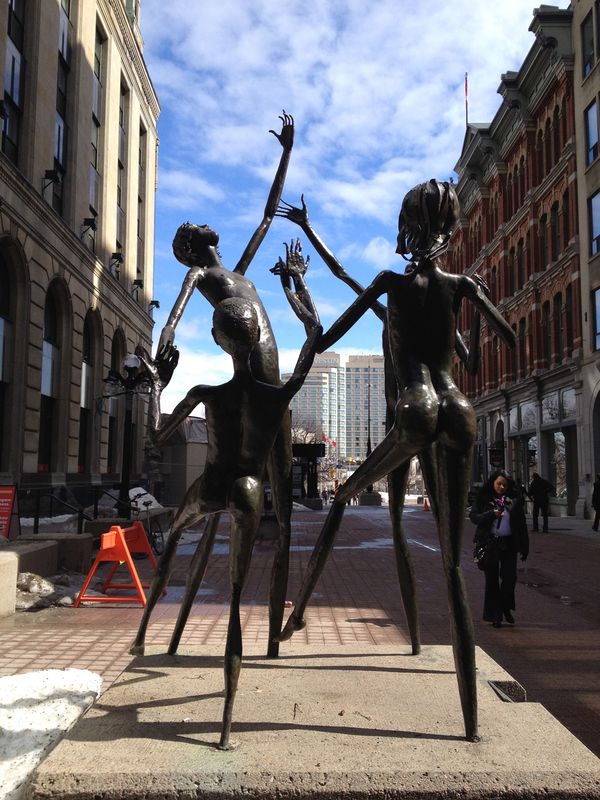 Along Sparks Street, mid block between Elgin and Metcalfe, you will find Joy. As the accompanying plaque describes, it was ‘Donated by E.R. (Bud) Fisher to the Sparks Street Mall Authority and the citizens of Ottawa. Sculptor Bruce Garner. A A bit further west where Sparks meets Metcalfe Street you will encounter the bear. This sculpture was recently relocated to this location from the opposite end of the block near Elgin. Thus ends the first tour of sculptures by Bruce. A second tour of other works can be found by clicking here. Ottawavelo! Thank you for doing this! I have wanted to plot a google map route to my fathers works, but google needs the exact addresses, which I do not have. I live in Alberta. Dear Tania – I am very pleased you approve the route. I hope it does some service to the memory of your father and the wonderful contributions he made to our city through his art. I think it does do some service. Often people want to take a tour of his work, and I have not been able to provide them with a route. He has a lot more sculptures in the Ottawa area. Hopefully one day they can all be on this map. If you want to work on it more some time, I suggest you contact his wife through his website for help with more locations. I would love to find out where more of his works can be found within the area and maybe prepare a second tour. Thanks for the idea. THANK YOU SO VERY KINDLY FOR DOING THIS! Bruce would be thrilled! I am Tamaya Garner his wife and If you want I can give you locations to many others downtown and around ottawa easy biking. Just let me know how to send you the information. Hi Tamaya – That would be great. You can email me the locations of Bruce’s other works within the area to brian@epdc.ca and I will see if I can conjure another tour.